So, you have some artwork, and you're wondering how to hang it? To hang artworks, it's generally recommended to hang the top about 1.8 - 2.2m from the floor level. But really, you want to hang them where they fit in with your furniture and more importantly where/at the height you interact with the artwork best. After all, artwork is a very personal thing, just like your home, so you should personalise how you hang it! I pick my spot.... choosing a spot where it will look great but also where it's not in direct sunlight all day, or over somewhere steamy/where there are lots of temperature changes. If it's a masonry wall, I make sure I have the right picture hooks with the little plastic sleeves to sit over them, and an impact drill. I also want to make sure I'm not going to hammer any nails into any electrical wires.... so, use common sense & a small nail and if in doubt, ALWAYS get a pro to check it out! Better safe than sorry. When I've picked my ideal spot, I measure roughly how far the picture wire is from the top of the canvas. I then measure how high I want the top to sit on the wall, and subtract the amount from the first measurement to get the height where it will hang. I make a tiny pencil mark there. It's useful if you stretch out the wire/string when you take the first measurement so you it's more accurate with the weight of the actual painting. If I'm using a picture hook, I carefully place the outer part so the hole sits over the pencil mark, and using a hammer and the nail, gently hammer it in making sure it goes in on the right angle. This is easy to do as the outer part guides the nail. Sticking the art on the hook.... pretty simple really, but I always use a little spirit level to make sure it's actually level. 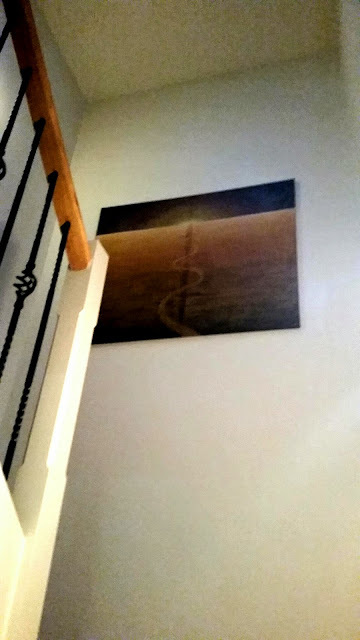 If it's a particularly large or awkward piece, I usually enlist the help of my hubby to lift it on, they will lift it and I'll climb underneath and guide the wire onto the picture hook then we will both move it to the right/left so it's sitting kind of in the middle. It's always best to check that the picture hook you're using is the right type and can handle the weight, the last thing you want is it coming off the wall in the middle of the night!